Amazing Amber Jewelry Handcrafted by Experts Amber Artisans. Baltic Amber was formed many years ago when forests in the Baltic Sea region shed their precious sap (resin) into the earth. As the earth flowed into the Sea, so moved the Amber, and eventually, onto the shores and the waiting hands of those who understood its miracle. So how does the raw material a Fossil Resin turn in to such precious Amber Jewelry we see today? To answer that question, we must first examine what Baltic Amber is truly made of. The Baltic Amber that is drawn from the Sea is rough around the edges (to say the least) but is still a stunning lapidary product. It is a fossilized organic substance Resin and not a mineral. While it is by nature very soft, it is still strong enough to be cut, ground, drilled and polished. It will stand up to wear without scratches or cracks. Lithuanian Amber Artisans have been working with natural Amber and making Baltic Amber Jewelry for many generations. It is a life's work to perfect what people in the Baltic States referral to as their "gold". To begin the process, the artisan grinds raw Amber on a belt, or sanding wheel. It is a tricky process and great care must be exercised to keep the fingers out of harm's way. This step strips the natural outside skin of the Amber and also brings the Amber to a desired shape or form although the surface is still rough. Next comes prepolishing Amber on the mop. 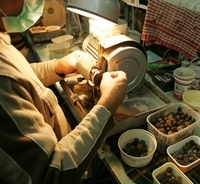 For this process, most artisans use compounds with a high concentration of wax. This first polishing can also be done very well with grey compound but artisans never use compounds with a color extract that can be absorbed into the pores of the amber and become a coating which can reduce Amber's naturally healing properties. The shape of the Amber can also be refined during this polishing. Again great care is taken to ensure that the Amber isn't ripped away by the mop which results in a crash to the floor. The good news is that the Amber can endure this event and continue to be polished and shaped without significant damage. When prepolishing is completed, the Amber is ready for final polishing done with a very soft, clean cotton buffing. Artisans use their own special combination of compounds from complex blends of candle wax with finely ground chalk power to - who could have guess - toothpaste! Next, the Amber is put into a metal barrel filed with water and sand to tumble which shreds the hard exterior layer. Following this process, the Amber is then put into a barrel filled with soapy water as well as pumice. It will then be tumbled for approximately 12 hours and will begin to have a very smooth finish. But we're not done yet! Using a dry barrel which must be made of wood or similar soft material, built in a hexagonal shape, and drilled with a pattern of tiny holes so the Amber can still breathe, the amber is tumbled again overnight using a mixture of small cubes of wood and a specially created natural paste. The Artisan is now ready to work with the final Amber product in all its natural beauty. The Artisan's tool for this phase is a modified drill bit which will either create the space or hole to insert the Plastic Closure pieces or to pass through the natural silk braided threads. It is critical to maintain a perfect alignment with the Amber and the drill to maintain accurate perforation. However, sometimes it is necessary to redrill and that is accomplished successfully with a bit of mineral oil. There will be a tendency for the Amber to become warm during all three stages of its journey from raw material to the finished product, namely sanding, drilling and buffing. Not to worry. It's just Amber showing it's radiant, breathing side. If the Amber is extremely young, you can always utilize water on the sanding wheel to cool it down. Natural Baltic Amber in any final form of Amber Necklaces, Amber Bracelets, Amber Earrings, Amber Pendants, Statues, etc., should always be kept in a soft, lined container such as a wooden box or cloth bag when it is not being worn. This is both to protect the surface of the Amber as well as ensure that its natural Homeopathic Properties of Amber are preserved. Our very best regards and if you have any questions about Amazing Amber Jewelry please let us know.